Great linebacker on tough Bears teams of the late 40's and early 50's that never won a playoff game. According to the Chicago Bears Media Guide, in a four-play stretch in the 1952 Pro Bowl, Connor made two tackles in a row, then a quarteback sack and finally batted down a pass in the end zone. 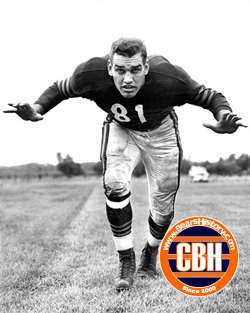 Originally drafted by the New York Giants in 1946, then traded to the New York Yanks, then the Bears. Played linebacker, offensive tackle and defensive tackle. Elected to the Pro Football Hall of Fame in 1975. Died in 2003 at the age of 78.